After a lifetime of thinking gym membership was a waste of money, I finally decided to give it a try. The whole "exercise at home" thing just never worked. When you're at home, you just want to relax. When you go to your living room and you're confronted with the TV, the treadmill and the Lazyboy, how many of us actually choose to watch TV while on the treadmill? I find it really hard to hear anything too when that thing is so noisy. When I try exercising at home, I find I get bored really fast. There are so many more distractions there. I end up quitting after about 10 minutes. If I walk the dogs I can make it last 20 minutes. This is no way to get in shape. At the gym I found myself surrounded by people whose sole purpose was to get or stay fit. (I'm going to ignore the ones who are there to pick up chicks.) I was also surrounded by all these fascinating machines to exercise various parts of your body. Every time I've gone to the gym this week, I ended up staying at least an hour and a half! A far cry from 10-20 minutes, don't you think? In the end, I think the environment you are in helps you to maintain focus. Many people have a hard time working from home because it's so easy not to work there. Sure it's convenient and you save gas money, but in the end most of us get more work done at the office. The same goes with the gym. I never believed it before, but after experiencing it myself, now I'm a believer. The gym, provided you find one you like, isn't so bad after all. If you're trying to work a day job while dedicating time to eating healthy and exercising, trying to advance your education could be a challenge. There just isn't enough time in the day to balance everything. An degree online program could be the answer. Capella University is one such organization to offer such programs. With various degress available in business, information technology, education, human services, and psychology, there's a little something for everyone's goals. About 16,000 students from around the world are currently enrolled. They're headquartered in Minneapolis, but you don't have to set foot there to enroll. Isn't the Internet wonderful? Anyone who has had to go to the hospital knows how important it is to have health insurance. Doctors are EXPENSIVE without it! (All those years of med school, they're looking to get their money back in spades.) If you're lucky, your employer provides health insurance for you. However if you're not one of the lucky ones, you may be at a loss as to which to choose for yourself. That's where a site called Vimo comes in. Whether you're an individual or a small business, you can use this site to compare health plans and other health services, like hospital prices or medical procedures. It's an interesting portal if you're shopping for a doctor or seeking insurance coverage. With a tool like this, you can make more informed decisions that are right for you. Daylight savings ends this month on October 29th. I personally wish they would just leave the time alone, but I am certainly looking forward to "falling back" an hour. I'm hating that it's dark now when I wake up in the morning. The sun is a natural alarm clock for your body. This is why one way to help with jet lag is to drag yourself out of bed in the morning and just sit outside for an hour. This helps to reset your body clock and tell your body that right now is supposed to be morning. It should be easier to get up the following morning. I haven't tried this myself, but I've heard it works. Jet lag requires a person to travel, which I don't do much of, unfortunately. If anyone has tried this method, comment here and let me know how it works for you! Ideally, our diets would be highly varied and consist of unprocessed foods and lots of fruits and vegetables. Unfortunately for the majority of us, including myself, this just isn't the case. Time, willingness and money are all hinderances to getting the nutrition we need for optimal health. This is why some supplements are important. If we can't get the nutrients we need from our diet, the next best thing is through vitamins and other supplements. Take omega-3 for example. Normally we would get it by eating fish and flax seeds. However the mercury levels in fish these days make it a little dangerous to eat large quantities of fish. And how many of us add flax seeds to our meals? There are lots of specially formulated supplements, geared towards conditions like osteoporosis, menopause, pre-natal, and women's vitamins. Considering the volume and variety of supplements for women that are available, you should be aware of any possible overlap or conflict that some of these might have. For example, calcium will inhibit the absorption of iron. This doesn't mean you shouldn't take them. It just means it's best to consult with a doctor what supplements are most suitable for you. My doctor recommends 1200mg of calcium daily. What does yours tell you? Some people believe "you are what you wear". (If this were true I'd be quite the bum.) This includes jewelery. The bling you have dangling from your neck or hanging on your ears is a reflection of your personality and who you are. Whether you're considering gold chains, silver hoops or diamond rings, each person will prefer something a little different. Good jewelery salespeople will know this and try to gauge what kind of person you are and what you might be looking for. Good shoppers won't buy the first thing they see. Are you familiar with Nutella? It's a sweet chocolate and hazelnut spread that is quite tasty with bananas. You might have had them with French crepes on some occasion. Well I'm sorry to say that you need to cut your ties with Nutella. Last year Choice magazine published the top ten processed food items (out of 50 that were tested) with the highest levels of trans fats. In that top ten was Nutella. I was bummed out when I first found out a few years ago. I had first gotten to liking the stuff when I was in Las Vegas and we were having breakfast in the Paris hotel. Banana and nutella crepes, mmmmm. After coming home I went to the store to get some, but read the back of the label first. Partially hydrogenated oils were in it. Damn. I was so bummed. But then earlier this year I discovered a product that was extremely similar to Nutella. I found it in Big Lots of all places (you might have known this chain as Pick 'n Save). 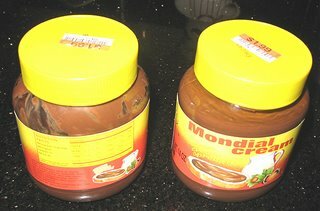 For only $1.99 I got a 14 oz jar of what was called "Mondial Cream". It's a product of Italy and tastes just like Nutella to me. It contains the following ingredients: Sugar, colza oil, low-fat cocoa powder, palm oil, hazelnuts, whey milk powder, lactose, skim milk powder, and sunflower lecithin. I searched the web for more info on this product, but wow, I couldn't find a thing! Only one Italian online store mentions it, and no photos. How on earth did Big Lots get it? Anyway, I'm going to snap a photo myself so you know what to look out for. According to something I read, the demand for silver has exceeded supply every year since 1990. I never thought about this before. I think of silver in terms of jewelery, but apparently some people buy it as coins or ingots for trading purposes. I just can't wrap my head around why this is important to anyone. Precious metals are harder to find than rocks, therefore they have much more value. But what good are they... they just symbolize some kind of value like paper money. I guess I'll just never understand. But it doesn't matter, because the trade of silver and other precious metals will go on. There are all sorts of weird rumors about Ted Murphy, founder of PayPerPost. But I know what the real truth is. How I know is not important. It's what I know you should be interested in. It's all for scientology. See, he talks to Tom Cruise all the time, hashing out ideas on how to glorify the cause and make more money in order to reach out to their outer space friends. The whole putting ads on blogs is just the first step. Eventually there will be requests trickling in to post about scientology and aliens. Just you wait. In the mountainous Kagawa region of Japan, home to olive trees and cuckoo birds, a white sweet potato (Ipomoea batatas) eaten raw has long been a traditional treatment for anemia, hypertension, and diabetes. Now marketed in Japan as a food additive for diabetes prevention and treatment, the tuber extract, called Caiapo, has attracted the attention of European researchers. So far, this sweet-potato extract shows promise. In a joint Austrian and Italian study of 61 people with type 2 diabetes, those who took 4g of Caiapo daily for 3 months saw blood sugar drop 15 points -- a modest fall that could allow diabetics to reduce or even quit their blood sugar-lowering meds. Cholesterol and triglycerides also fell slightly. It will be awhile before we're able to see it in the U.S., but it's nice to know there are natural remedies out there. Lap-Band surgery, have you heard of it? I actually hadn't until now. It's supposed to be a surgical solution to obesity, similar to gastric bypass. The way Lap-Band Surgery is described, a prosthesis known as a "lap-band" is placed around the upper stomach to create a smaller stomach pouch that in turn limits the amount of food an individual can fit into their stomach. Sounds a lot like stomach stapling to me. Although I think having some kind of band is preferable to staples. I mean, it just sounds better, if you think about it. It's less invasive and you aren't puncturing or physically altering your stomach. Just sort of restricting it a little. As always, these types of surgery should be a last resort. If diet and exercise has failed you for one reason or another, then this is definitely one option to consider. Vegetable oils are likely called vegetable oil because of the thought that "vegetables are good for you". It's all about packaging the product in the most marketable way possible. More accurately, these oils should be called seed oils. Canola, sunflower, corn and safflower oils are all made from seeds. You don't see broccoli oil or spinach oil because vegetables contain barely any oil content at all. But "vegetable oil" sounds more healthy and appealing than "seed oil", doesn't it? The method by which these oils are extracted from the seeds determines how much nutrition (or harmful elements) is in the oil. As discussed in an earlier post, chemical extraction is the most common and the most harmful way. You want to look for "cold pressed" or "expeller pressed". There actually is a difference between cold- and expeller-pressed oils. According to this article I found by Spectrum Organics, "All cold pressed oils are expeller pressed. But all expeller pressed oils are not necessarily cold pressed. It all has to do with temperature." You should read the article yourself for more details. The interesting thing is that the term "cold pressed", while strictly regulated in Europe, is very loosely used in the U.S., often erroneously and in a misleading manner. It's hard to go by what the label tells us sometimes. The phrase that we want to look for then is "unrefined". Refining is the process where they treat the oil in all sorts of horrendous ways (mentioned in the previous post about oils), so a bottle marked "unrefined" would be the way to go. Manufacturers are always trying to trick us for a profit by finding labeling loopholes. It's up to us to be smart and know what to look for. Are you a creative blogger AND know real estate? You'd have an edge over me then, because myhomething is looking for people with excellent writing skills. I think I write reasonably well, but real estate just isn't my thing. It's hard to be creative an interesting when you're writing about something that doesn't interest you. But if you think you'd do a decent job writing about this site's lead generation program, then maybe you should check it out. You might have seen in some grocery stores that some cooking oils say "cold pressed", others say "expeller pressed", but most say nothing at all. The vast majority of cooking oils sold commercially, like Wesson, Mazola and practically all store brands, are extracted in a way that makes you think twice about buying them. The oil is separated from its food source with hexane or other petroleum solvents and then boiled to drive off the toxic solvents. The oil is next refined, bleached, and deodorized, which involves heating it to over 400°F. The oil extracted this way still contains some undesirable solvent residues, while the amounts of many key nutrients (especially vitamin E) are significantly reduced. Antioxidants or preservatives such as BHA (butylated hydroxyanisole) or BHT (butylated hydroxytoluene) are then frequently added. The resulting product lacks flavor, aroma, pigments, and nutrients. Typically oils that looks very light and clear in color have been processed in this way, called chemical or solvent extraction. The process strips out anything good in the oils and replaces it with chemicals. It's no wonder cancer is so widespread with "unknown" causes. It's really hard to avoid these types of oils because they are so cheap and they are also used in practically all pre-packaged foods that contain oil. I've only seen snack foods from health food companies that specify they use expeller-pressed oils. I don't remember which they are now, but next time I see them, I'll post about it. I'll go more in depth about cold-pressed and expeller-pressed oils in the future, but for now I'll summarize by saying these are more natural methods for extracting oils from the seeds. You retain the nutrients without introducing any foreign chemicals. Doesn't that sound so much better for you? Evil? I don't think so. Once in a while you'll see posts in here that are not health-related at all. Am I just going bonkers? Maybe so, but it's just a little effort on my part to squeeze a little extra change where I can in order to make ends meet. There are companies who will pay for bloggers to post about certain things, so on occasion I will participate. Some people despise this practice and think it's devious and evil. Evil? That seems a little extreme to me. Annoying? Possibly. But if people are reading my stuff, it's because they find me interesting at some level. So does it really matter what I write about? I choose what I want to write about, and whatever I choose, I always try to make it an interesting read. So what if it happens to be about gift baskets or online degrees? I still put myself into my writing, so there's always some value in it. It's not like I'm ever promoting harmful things like cigarettes or pedophilia, that would be evil. But to talk about random products as blog advertising to get a little bit of pocket change out of it, that's not evil at all. That's just a small help to my frazzled bank account, and it harms no one. My initial reaction to these were, "Wow these are yummy, and they're vegetables!" Yes they are, but they're processed. "But they're baked!" Yes they are, but they're likely processed first. I was sharing these with my sweety and remarking how odd and un-vegetable-like the consistency of these things were. She said they likely ground up the green peas and then shaped them. For some reason I never thought of that. It makes perfect sense. You grind up the vegetable, mix it with rice and oil, then mold them to look like green beans. That would explain why they're all the same size. Duh, I didn't notice that either. Bottom line is, treat Snapea Crisps as another form of junk food. It's still better than chips and other fried foods, but it's best to eat these in moderation. So there's this company that does blog advertising by paying bloggers to post about stuff. Apparently this is some big controversial thing, but not so controversial that they couldn't manage to get $3 million in venture capital. I guess somebody thought it was a good idea. The main thing people are complaining about is that bloggers are not required to disclose that their post is a paid advertisement. I don' t think they give readers enough credit. I mean, can't you tell the different between someone writing about a product they use and someone writing some fluff? I would think the difference is pretty clear, wouldn't you? 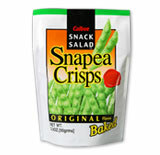 Snapea Crisps - What yum! I frequent Trader Joe's quite a lot and love the variety of foods they have that are reasonably priced while being, for the most part, healthier than your average snack aisle. I love trying new things, so when I see something different that sounds good, I'll usually buy a bag to try it. Last week I bought a bag of "Snapea Crisps". It was an interesting concept I'd never heard of before. They're supposed to be snap peas that have been salted and baked. Hey I'm all for alternative ways to get veggies into my diet. I know I don't eat enough as it is. I finally opened the bag today. Wow these things are GOOD! It was completely unexpected. I was thinking it would be stiffly crunchy like some baked vegetable chips. But the consistency was unlike any vegetable I have ever seen. It was more like a Funyun than a pea pod. I tell you, it was bizarre. I only see this type of thing when things are deep fried, yet on the bag they claim that it's baked. Baked? Well that's good, but there was still a lot of oil on it. I peeked inside the bag and the sides were coated with oil. My fingers were oily after eating a few pieces. My guess is they soaked the pods in oil for a long time before actually baking them. Still, these are quite yummy, and a much better alternative to conventional potato, corn and tortilla chips. They have 5g of protein per serving and only 14g of carbs. It's a great balanced snack you can eat without worrying about your blood sugar spiking, and the ingredients are minimal with no chemicals. Bear in mind however that the fat content is something to consider. It's 8g of fat and 150 calories per serving. Ingredients: Green peas, Corn oil, Rice, Salt, Calcium carbonate, Ascorbic acid (Vitamin C). Hmm... rice is in it, my guess is that's what helps to give the product its light and airy texture. The crispness and the flavor are quite addictive. I think I'll continue buying these. Seattle is one of those places I've always wanted to visit. It's rainy, touristy and close to a lot of state park greenery. I want to see it at least once. I don't know if I'd want to live there though. I hear their traffic problems might be worse than LA. I could be wrong though. We've entertained the thought of moving there once or twice. Considering all the problems I've had with house ownership, I wonder how much better it would be with a condo? It would be cheaper, for one. They're more plentiful as well. There's even a site dedicated to selling Seattle condos. It allows realtors, owners and developers to post their listings. According to them, buyers can "bypass the middlemen". Um, correct me if I'm wrong, but aren't realtors the middlemen? They also have some program called "Building Specialists" where real estate agents specialize in luxury condos. Right, like I'll be needing that service anytime soon. Right now my idea of luxury is faux-fur rug on the floor.